Cavernous hemangiomas aka cavernous angiomas aka cavernomas are angiographically occult vascular malformation, which most often present as intracerebral hematoma or seizures in young adults. These are second only in frequency of occurrence to developmental venous anomalies (DVT) and equal in that of cerebral arterio-venous malformations. ,, Dura-based cavernoma hitherto is a rare clinico-pathological entity affecting the central nervous system. ,, We present a 13-year-old girl who presented with intracerebral hematoma secondary to a temporal convexity dura-based cavernoma. A 13-year-old girl presented with sudden onset of headache and vomiting. The headache was severe in intensity, localized to the right temporal region, and referred to the right eye. There was no history of loss of consciousness, seizures, diplopia, speech or memory disturbance, and limb weakness. On examination she had no focal neurological deficit except for mild upward gaze restriction. Initial CT brain showed a 7 × 5 cm right temporal intracerebral hematoma with mass effect and midline shift of 0.4 cm. MRI brain with GADO was done which showed an acute-to-subacute hematoma with a dura-based lesion with contrast enhancement [Figure 1]. Six-vessel cerebral DSA showed tumor blush with feeding vessel arising from the right middle meningeal artery and there was no evidence of arterio-venous malformation [Figure 2]. 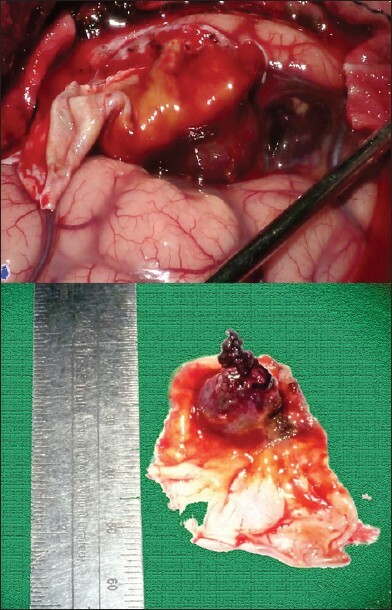 In view of significant mass effect and suspected underlying pathology it was decided to do craniotomy, evacuation of intracerebral hematoma, and excision of the dura-based lesion. Right fronto-temporal craniotomy was performed and on opening the dura, a "mulberry-red" lesion was found attached to the convexity dura. It was predominantly extra-axial with a protruding portion dipping into the hematoma cavity. The tumor was resected completely along with its dural attachment and the hematoma evacuated [Figure 3]. The patient made an uneventful recovery following the surgery with no deficits. 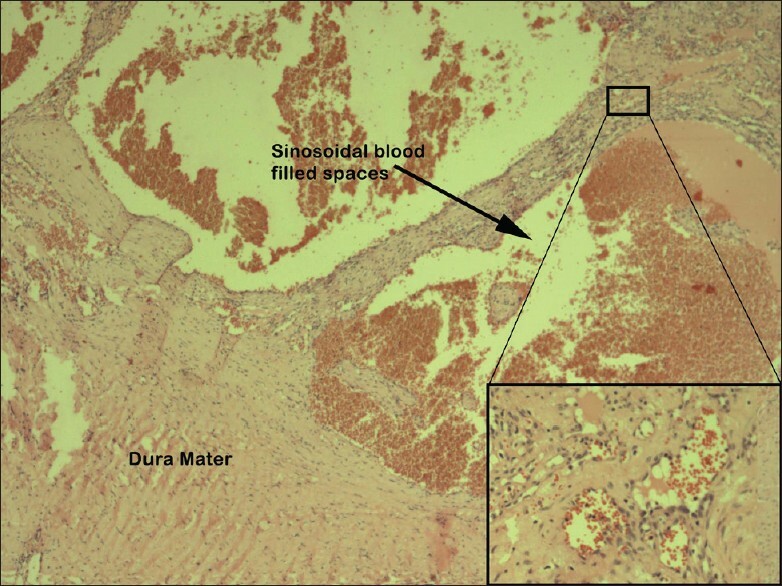 The histo-pathological study showed multiple sinusoidal spaces filled with blood lined by thin endothelium cells, consistent with cavernous angioma [Figure 4]. Cavernous angiomas or cavernomas are second only to arteriovenous malformations presenting in children. They show no sexual preponderance. They have a silent course and a sizeable number of cavernoma is picked up incidentally. Seizures and hemorrhage are the two common modes of clinical manifestation. Radiological appearance on CT brain is often due to the presence of blood in and around the lesion. On MRI, the lesion has a characteristic "pop corn" appearance due to the presence of varying stages of blood degradation products. Histologically cavernoma is formed from blood filled sinusoidal space lined by endothelium devoid pericytes, smooth muscles or elastic fibers. Cavernous angioma can occur in any part of the body and the central nervous system. The locations in the order of highest to lowest frequency are cerebral hemispheres, brain stem, spinal cord, and extra-axial location. , Infrequent locations such as skull base dural angiomas in the cavernous sinus, , intraventricular cavernoma,  optico-chiasmatic cavernoma,  and orbital cavernoma  have been reported. Posterior fossa dura-based cavernoma arising from superior petrosal sinus was reported by Kocak et al., in 2002,  and a lesion arising from cerebellar falx by Ito et al., in 2009. McCormick in 1966 had described angiomas of dura mater. Hitherto a supratentorial convexity dura-based cavernous angioma is a very rare entity. Dura-based parietal convexity cavernoma mimicking meningioma was reported in a 77-year-old lady who presented with seizure by Perry et al., in 1993. Joshi et al. have recently (2009) reported a supratentorial convexity dura-based cavernoma in a 15-year-old boy who presented with headache and showed good results following surgical excision. Dura-based cavernous angioma presenting with large intracerebral hematoma is an extremely rare case. As with intracerebral cavernoma surgical excision gives complete and lasting cure in these patients. 1. Robinson JR Jr, Awad IA, Masaryk TJ, Estes ML. 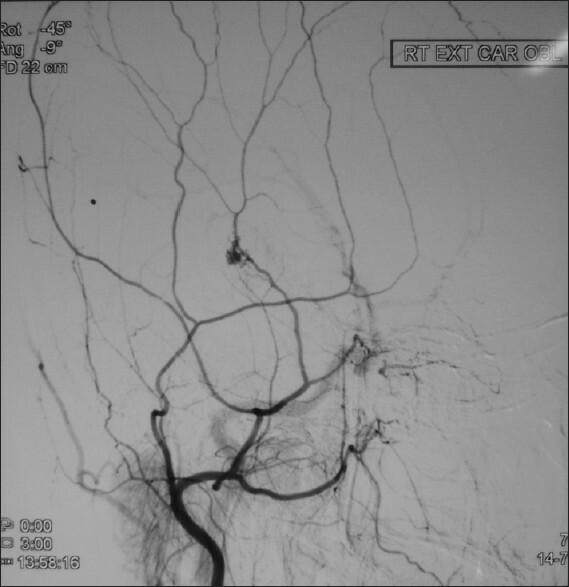 Pathological heterogeneity of angiographically occult vascular malformations of the brain. Neurosurgery 1993;33:547-54; discussion 554-5. 2. Rigamonti D, Spetzler RF, Medina M, Rigamonti K, Geckle DS, Pappas C. Cerebral venous malformations. J Neurosurg 1990;73:560-4. 3. Otten P, Pizzolato GP, Rilliet B, Berney J. 131 cases of cavernous angioma (cavernomas) of the CNS, discovered by retrospective analysis of 24,535 autopsies. Neurochirurgie 1989;35:82-3, 128-31. 4. Perry JR, Tucker WS, Chui M, Bilbao JM. Dural cavernous hemangioma: An under-recognized lesion mimicking meningioma. Can J Neurol Sci 1993;20:230-3. 5. Ito M, Kamiyama H, Nakamura T, Nakajima H, Tokugawa J. Dural cavernous hemangioma of the cerebellar falx. Neurol Med Chir (Tokyo) 2009;49:410-2. 6. Joshi V, Muzumdar D, Dange N, Goel A. Supratentorial convexity dural-based cavernous hemangioma mimicking a meningioma in a child. Pediatr Neurosurg 2009;45:141-5. 7. McCormick WF. The pathology of vascular ("arteriovenous") malformations. J Neurosurg 1966;24:807-16. 8. McCormick WF, Hardman JM, Boulter TR. Vascular malformations ("angiomas") of the brain, with special reference to those occurring in the posterior fossa. J Neurosurg 1968;28:241-51. 9. Lonjon M, Roche JL, George B, Mourier KL, Paquis P, Lot G, et al. Intracranial cavernoma. 30 cases. Presse Med 1993;22:990-4. 10. Mahla K, Rizk T, Fischer C, Belliard H, Vallée B, Fischer G. Intracranial cavernoma. Surgical results of 47 cases. Neurochirurgie 1999;45:286-92. 11. Bristot R, Santoro A, Fantozzi L, Delfini R. Cavernoma of the cavernous sinus: Case report. Surg Neurol 1997;48:160-3. 12. Finkemeyer H, Kautzky R. Cavernoma of the sinus cavernosus. Zentralbl Neurochir 1968;29:23-30. 13. Meilán Martínez A, Vega Valdés P, Santamarta Liébana E, Rial Basalo JC. Intraventricular cavernoma in the foramen of Monro: Particularities due to its atypical location. Radiologia 2009;51:605-9. 14. Shkarubo AN, Serova NK, Tropinskaia OF, Shishkina LV, Pronin IN. Chiasmatic cavernoma. Zh Vopr Neirokhir Im N N Burdenko 2005. p. 20-1; discussion 21-2. 15. Born C, Rademaker J, Hosten N, Felix R. Hemorrhagic cavernoma or ruptured dermoid of the orbit: Diagnosis with MRI. Orbit 2001;20:291-5. 16. McCormick WF, Boulter TR. Vascular malformations ("angiomas") of the dura mater. J Neurosurg 1966;25:309-11. Almakadma, Y. and Alkhani, A.M.